Emergency Lighting Systems – How Do They Work? Home » Security » Emergency Lighting Systems – How Do They Work? Before long, we get tired of hearing the fire alarm bell ring. We roll our eyes at our colleagues and share grumbles about the idea of standing outside for another drill. Fire safety however, has saved thousands of lives to this day. The minds behind keeping us safe had two main problems to solve when thinking about lighting your path to safety. If there were a real fire, precious lives would be stumbling through potentially thick black smoke. Problem one: it needed to be fully functional without electricity, and two: it had to turn on automatically without any manual input. So how do Emergency Lighting Systems work? Let’s not keep you in the dark; read on! The first emergency lighting was brought in after three major fires occurred in the early 1900s; these three tragedies combined took the lives of over 800 people. It was about time something was done to try to stop such things from happening again. When emergency lighting was first introduced, big incandescent spotlights were used around the buildings. They were set up on top of huge batteries, similar to the ones used in cars, and wired into the building’s circuits. When the power in the building was cut, or the circuit was broken, each bulb’s transfer switch turned the spotlight on to light the area while the battery had power. Since technology has come such a long way since ‘then’, the way our emergency lighting works has evolved in leaps and bounds too. New laws and problems emerged as we get safer and more secure; some might call it red tape, but it’s better to be safe than sorry! Each individual city has building and fire regulations to look at paths people would take out of a building. Every building is different, after all, so your quick exit needs to be specific to the place! Each light has to have at least an hour and a half of charge, leaving plenty of time for you to find your way out, and for the emergency services to find their way in if necessary. Immediately before the building is constructed, emergency lighting systems are planned and plotted on schematics and blueprints. So now to shed some light on the ins and outs of the electronics. How do the systems of today light our way? In basic terms, the systems have moved on from mechanical switches that were used in the first emergency lighting systems. Many electronic systems today, Emergency Lighting included, are wired into something called a ‘UPS’. UPS stands for ‘uninterruptable power supply’. These clever systems are made up of an inverter, a transformer, and a transfer. These means that when there’s no fire, and things are running like clockwork, the building’s electricity supply keeps the battery charged and ready to go in case of an emergency. The same second that the building’s power fails, the emergency lighting kicks in using the UPS system, and all its components. 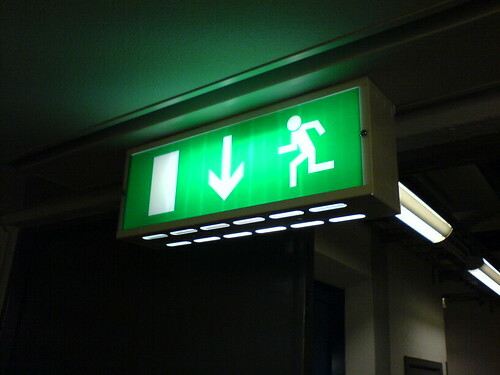 Emergency lights are always at exits, along corridors and in stairwells. Some emergency systems today even have generators that will light an LED pathway along the ground, much like you would see lighting the steps in a dark cinema! Needless to say, the electronics inside today’s systems have far advanced from car batteries and single bulbs. Lead-calcium batteries power the halogen bulbs or LEDs, and operate on a much lower voltage than their predecessors. This means that they can run for longer, and use less power. To make the most of the light, the bulbs are usually placed in parabolic reflectors, which are similar to the mirrored reflectors in car headlamps. Although these systems are much more complicated than they were 50 years ago, you may never even notice they are there! Other than the odd green exit sign, of course. A lot of hard work and planning goes into Emergency Lighting so much so that you may not even realise it’s there! But as always, it is in place in our schools, workplaces, hospitals and restaurants ready and waiting for when it’s needed. These incredible Emergency Lighting Systems make sure that if the worst should happen, we are well lit up, and well looked after. Safety first!